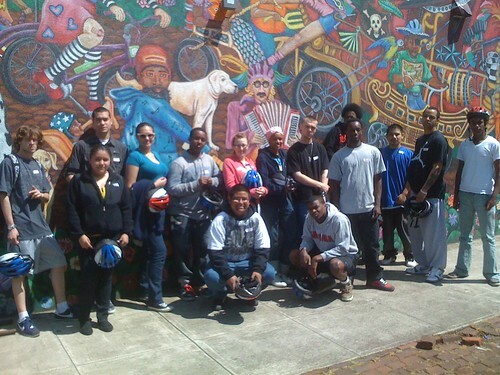 On Tuesday May 24th, 2011, we held our first Create a Commuter workshop with Portland Opportunities Industrialization Center (POIC), an organization that prepares at-risk youth for future success through education, leadership, family outreach, and employment training. Fifteen energetic young adults showed up to receive their custom built bicycles and to learn all of the rules of the road and commuter tips. The participants all knew each other, so they were boisterous and comfortable from the start, yelling out the answers when we would ask things like â€œWhen should you replace your helmet?â€ â€œ3 years!â€, â€œ5 Years!â€, â€œWhen it cracks!â€, etc. The weather was sunny and perfect, so we all headed out for a lovely ride to the Bike Shop, since the agency was about 1.5 miles away. There was no lack of energy or enthusiasm, so we made great time to the Shop, riding along the Going Bike Boulevard. We practiced locking up our bikes and then headed in to say hi to the mechanics who had built the bikes. Everyone loved seeing the new production space, and when we walked in, Forrest, a mechanic at Community Cycling Center, was building up a KHS Create a Commuter bike for the next workshop. Perfect timing! One of the young adults had been a Get Linked youth when she was in the 5th grade, and therefore used to hang out at the Shop all the time! She said she hadnâ€™t been back in years, and so being there brought back lots of great memories for her. We rode back along the Holman Bike Boulevard, and finished up the class with an interactive map reading activity, where they all plotted out how far they wanted to ride. In closing, almost all of them indicated that they were really excited to ride their bikes home, and they posed outside for a portrait before heading off into the warm sun.